Changing his son on a wheelie bin lid and in a car boot has led one father to call for baby changing facilities in public places to be accessible for both men and women.Tony Esposti wants the Welsh Assembly to make all new and renovated public buildings have unisex baby facilities.It follows an image of an American dad crouching down in a toilet changing a baby went viral, inspiring the 'Squat for Change' parental equality movement. "It's 2019," said Mr Esposti.He wants to know the "right facilities" will be available when he takes his two-year-old son Joseff out for day trips without mum Joanne. Mr Esposti's campaign was sparked when he was forced to change Joseff on a seafront in west Wales because the cafe he was eating in only had baby changing facilities in the female toilets.After #squatforchange started trending on social media last year when Donte Palmer's picture raised awareness of a lack of changing facilities in male toilets, Mr Esposti tweeted his own baby changing frustrations. 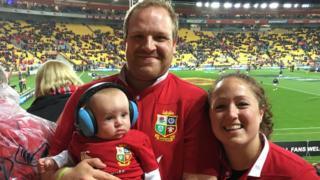 Mr Esposti, 35, a computer engineer from Cardiff, said: "Not having baby changing facilities accessible to both women and men is so easily solved. "Essentially, it's just a table." Should we ask babies for consent before changing their nappies"It's not just inconvenient for dad and their babies but for other people around you who don't want to see a pooey nappy when they are eating or just going about their business." Mr Esposti's petition asks the assembly to ensure "all future renovations and new builds within areas open to the public have an area that provides a safe and clean space to change babies/allow toddlers to go to the toilet safely".Building regulations set no requirements for baby changing provision but the Welsh Government's deputy minister Jane Hutt said in a letter: "Where baby changing provision is intended the statutory guidance and related British Standard recommends it should be accessible and not be in unisex toilets." The Welsh Assembly's petitions committee supported Mr Esposti's call at a meeting on Tuesday.It asked the government for clarification on design standards relating to baby changing provisions and called on it to consider talks with private sector shops and restaurants.